Fashion’s darling Tarun Tahiliani showed a line of easy silhouettes that featured kaftans, tunics, shift dresses, capes, capelets, jumpsuits and saris against a backdrop of a very stylish video featuring model and Bollywood actress Lisa Haydon modelling Tarun’s collection. International model Ujjwala Raut opened the show with a looped black will-powered midi, which was followed by a great mix of black creations with occasional bursts of colour. The line had exotic prints with a marked Russian influence of vibrant stripes and the tribal gypsy elements. The black and white striped cascading top and the asymmetric kurta with leggings, will-power corset dress, the black dhoti sari and choli brought a great fusion story. 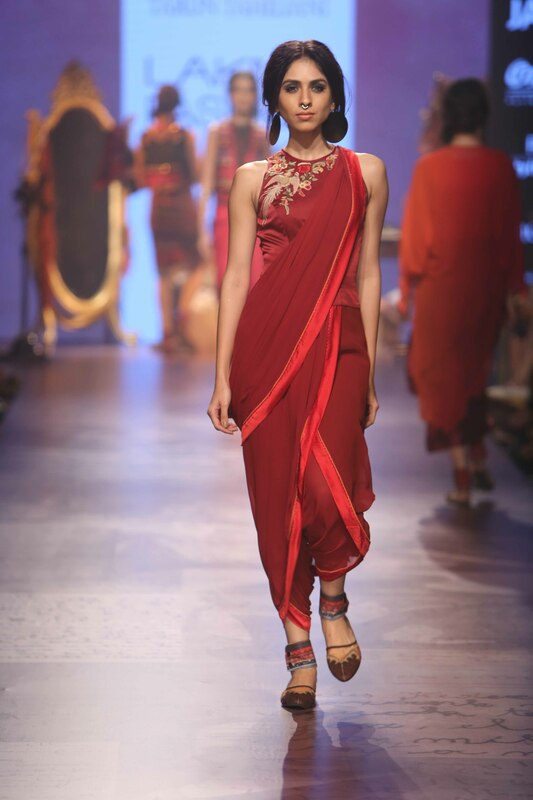 A maroon jumpsuit with embroidered printed belt and lungi dress were interesting diversions. 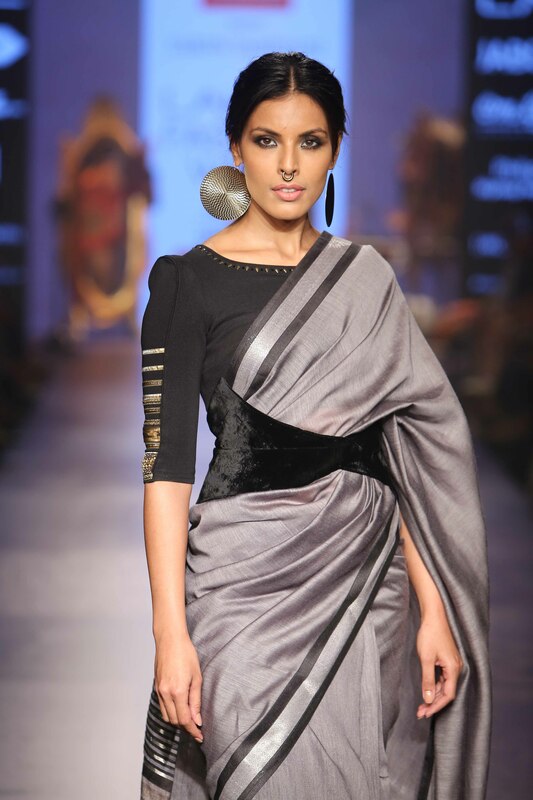 Some interesting variations seen on the ramp were the jumpsuit-sari, which looked easy to step into and and zip up, kedia style blouses with skirts, satin draped lungi cowl gowns, saris with velvet obe belts and printed tees with satin dhotis. 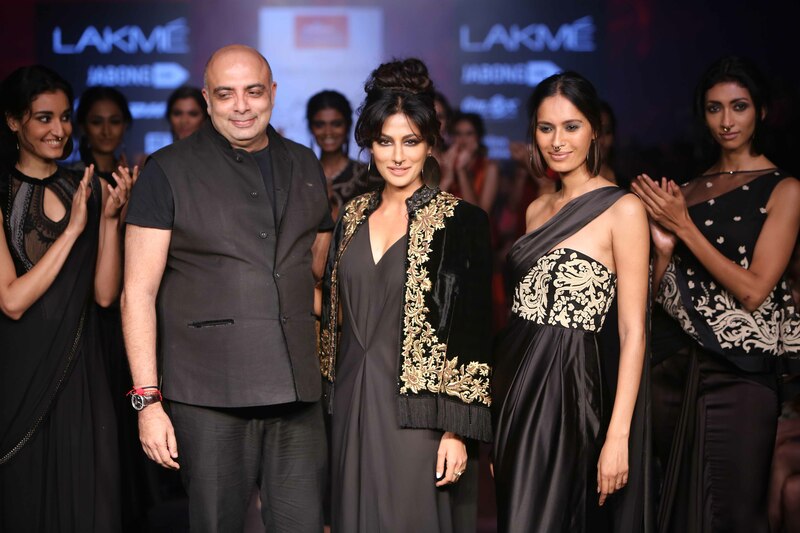 Chitrangada Singh brought a glamourous end to the show in a black draped gown and velvet cape splashed with gold embellishments.